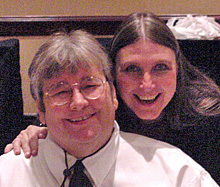 Convention Coordinator Sandra Stillwell with her beloved late husband Danny. Note: Sandra will be leaving for the convention hotel on November 1. She will be checking her e-mail as much as possible, but would like to get everything handled before she leaves. If you need her after that date, e-mail her, but please also call the hotel at (203) 348-7937. Be sure to leave a message if you don't get her on the phone. For urgent calls, call her cell phone (see above) if you cannot reach her through the hotel. For late-breaking convention news, join the "Convention Corner" Yahoo! Group. If you have technical difficulties with online registration, ordering, or payment, or problems with the Website in general, click here to e-mail the Webmaster.